Looking to replace your 18" speakers? Check out the wide selection of awesome subwoofers available from P Audio. 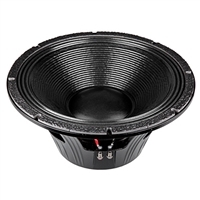 These high-power 18" subwoofers are available with standard or neodymium magnets, large voice coils and great sensitivity specs. If you are looking to push some air with your cabinets, get a P Audio 18-inch sub! You won't believe the tone and depth of sound.